Main Street Holly DDA’s success is driven by the support and efforts of our business owners and our community members. Main Street utilizes the “four-point” approach for community involved comprehensive downtown revitalization and management. Our four committees, made up of Design, Organization, Promotions, and Business Development, work together with the DDA Board to successfully complete shared goals. The Promotions Committee works to create a positive image that will rekindle community pride and improve consumer and investor confidence in Main Street Holly. The committee guides advertising, retail promotions, special events and marketing campaigns to help sell the image and promise of Main Street Holly and the whole Holly community. 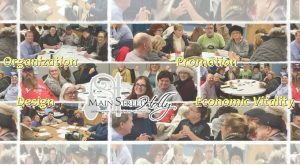 The Organization Committee establishes consensus and cooperation by building partnerships among the various groups that have a stake in Main Street Holly. The committee take input from diverse groups and communicates the mission and direction of Main Street Holly, and strives to keep everyone on the same page and working in harmony. The Business Development Committee strengthens Holly’s existing economic assets while diversifying economic base by retaining and recruiting successful businesses to provide a balanced commercial mix, sharpening the competitiveness and merchandising skills of business owners, and attracting new businesses that the market can support. The committee also works to identify and promote properties for redevelopment or occupancy. The Design Committee works on keeping Main Street Holly in top physical shape and creating a safe, inviting environment for shoppers, workers and visitors. Taking advantage of Holly’s historic architecture and unique features, from public and private buildings, storefronts, signage and way finding, parking areas, street furniture and art, landscaping and merchandising and window displays. PLEASE EMAIL Katy Golden Hughes at khughes@hollyvillage.com for more information on how to join one of our amazing TEAMS!